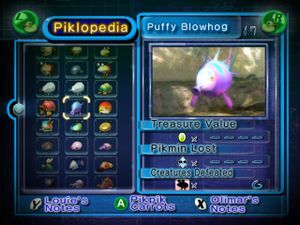 Screenshot of the Piklopedia, on the Puffy Blowhog's entry. This article is about Olimar's encyclopedia on the life-forms he has encountered in Pikmin 2. It is not to be confused with Pikipedia, the name of this Wiki. Document what needs to be done to open each creature's entry. Some need to be defeated, and others need to be touched, but there may be more complex mechanics. Document what exactly triggers the game to show the unseen entries's grid slots, as opposed to hiding them. Be more specific about what counts as "when the final boss is defeated" – is it when its health drops to 0, its treasures are recovered, the King of Bugs is recovered, etc. The Piklopedia (生物図鑑?, lit. : "Creature Picture Book") is an in-game list of all the enemies and plants in Pikmin 2 that the player has come in contact with throughout their exploration. The player can access the Piklopedia's menu by pressing / when on the area selection menu. This catalog also keeps track of how many Pikmin have been lost to each enemy, how many of said enemy the player has defeated so far, and how many Pokos the enemy is worth. For fields that cannot be counted, four dashes appear instead. On top of that, it also contains notes written down by Olimar and Louie; Olimar's notes talk about the enemy or plant in general, but Louie's notes, if available, normally explain some cooking recipes involving the creatures. Louie's notes only become available (permanently) when the final boss is defeated in any saved game. Selecting the slot of a creature that has not been seen yet will just produce static on the main "screen", and their grid slots will show their Piklopedia number, instead of their icon. Pikpik carrots can be thrown at enemies to see their reaction, although the throws cannot be directly aimed – not even with the New Play Control! remake's enhanced cursor – and are loosely based on the direction the camera is facing. Ultra-bitter sprays can also be used on the non-plant creatures by pressing / ; this does not affect the in-game spray count. The Piklopedia is the counterpart to the Treasure Hoard, which shares the same music. Note that Unmarked Spectralids will also appear in the Red Bulborb, Orange Bulborb, and Hairy Bulborb's entries, if the player has all four of these entries unlocked. The Spectralids here flutter about alongside the grub-dogs and sometimes land on top of them. When using the Piklopedia and the Treasure Hoard, the scenery will change depending on what area the ship is hovering on, on the area selection screen. Each object seen will spawn in a different, pre-specified location of the area. The Valley of Repose, the Awakening Wood and the Perplexing Pool have some notable differences compared to their in-game counterparts, while the Wistful Wild is barely any different. For a list of differences in the two versions of an area, please read the corresponding area article. The following maps illustrate a top-down view of the Piklopedia and Treasure Hoard versions of the areas, excluding the Wistful Wild, which has no visible difference. These slightly changed areas were also seen in prerelease material. Some enemies can actually die whilst on the Piklopedia. Volatile Dweevils blow up when awakened. Mandiblards will lose health if they touch water, and can even drown. Due to a glitch, if one petrifies a Hermit Crawmad on dry land and throws several Pikpik carrots, the creature will gradually lose health, and can die. Piklopedia menu showing a Waterwraith while it is stuck. The Pikopedia when the sun is setting down. A dummy icon texture named zzdummy can be found within the Piklopedia's icon texture files. It's unused in the game, and it must have been used during development to represent enemies that had no icons at the time. The icon textures for the Glowstem and Queen Candypop Bud have exact duplicates inside the game's files. The icon for the Fiery Bulblax is 80 × 80 in size. This size is only used for boss icons, whereas normal enemies have icons that are 40 × 40. This indicates that in some early stage in development, the Fiery Bulblax was meant to be a boss, as are the other two "Bulblax" grub-dogs. Thrown pikpik carrots will rotate to "face" the creature. Their stems will bend away from it. If a pikpik carrot lands near a Red Bulborb, Hairy Bulborb, or Orange Bulborb just as it is about to go to sleep, its yawning and lying down animations will be sped up. This page was last edited on February 16, 2019, at 16:47.